Summary and Definition: The Omaha people with the Quapaw, were originally a woodlands tribe of farmers who lived in longhouse villages inhabiting the area near the Wabash and Ohio rivers, near present-day Cincinnati, Ohio. The Omaha then migrated to the Great Plains and settled southeast of the mouth of the Niobrara River in the present-day state of Nebraska and in Iowa. The above picture of an Omaha warrior called Nom-ba-mon-nee, meaning Double Walker, was painted in 1832 by the famous artist George Catlin (1796-1872). The brave is holding a buffalo robe and is wearing leggings fringed with scalp locks. He has an arrow quiver attached to his arm. The fierce, proud, war-like brave wore striking red face paint and wore a roach headdress decorated with a single eagle feather. What was the lifestyle and culture of the Omaha tribe? The Omaha tribe called themselves U-Mo’n-Ho’n meaning "upstream people" and were later known as the Maha by the French meaning "a wandering nation". The French name 'Maha' was then changed to Omaha. Their homelands were first located in Ohio where they lived in well organised longhouse villages and raised crops of maize, beans and squash. The first encounters with Europeans were with fur traders. With the introduction of the horse in the 1750's they became great horsemen and eventually migrated to the Great Plains, in the modern state of Nebraska, searching for buffalo. This complete change of habitat led to the nomadic lifestyle of the Plains Indians and the adoption of the tepee as a temporary shelter. The encroachment of the lands resulted in the Omaha being moved to a reservation. Where did the Omaha tribe live? The Omaha are people of the Great Plains Native American cultural group. The geography of the region in which they lived dictated the lifestyle and culture of the Omaha tribe. Crops: The crops grown in the area were corn, beans, sunflower seeds and squash. They also enjoyed melons. What did the Omaha tribe live in? The Omaha tribe originally lived in fortified villages of 50-100 thatched bark longhouses. When the tribe migrated to the Great Plains they adopted the tepee as a convenient shelter for summer hunting trips. They also built earth lodges, similar to those built by the Pawnee. What language did the Omaha tribe speak? The Omaha tribe spoke the Dhegihan dialect of the Siouan language, closely related linguistically to the Ponca tribe. What food did the Omaha tribe eat? The food that the Plains Omaha tribe ate included fish and meat from Buffalo, elk, deer (venison), black bear and wild turkey. This food was supplemented with roots and wild vegetables such as spinach, prairie turnips and potatoes and flavored with wild herbs. Food in the form of dried buffalo meat called pemmican was stored for use when food was scarce. What weapons did the Omaha use? The Omaha lived under the protection of the powerful Pawnee, who claimed the whole Platte region. Their primary enemies were the Sioux. The weapons used by the Omaha warriors included bows and arrows, lances, stone ball clubs, hatchet axes, spears, and knives. Painted war shields were used on horseback as a means of defence. What clothes did the Omaha men wear? 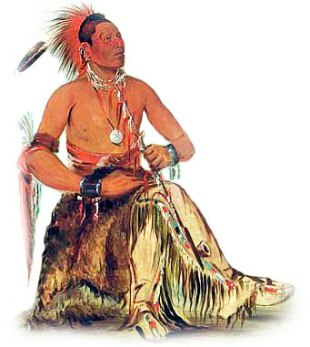 The clothes worn by the men of the Omaha tribe included breechcloths, buckskin tunics and leggings. Warm buffalo robes or cloaks were also worn to protect against the rain and the cold. The men wore soft moccasins to cover their feet, a light beige, slip-on shoe, consisting of a sole and sides made of one piece of leather. Roach headdresses adorned their heads. What clothes did the Omaha women wear? The women of the Omaha tribe wore clothes made from buckskin including knee-length dresses and leggings and buffalo robes during bad weather. The clothes of both men and women were adorned with ornaments, especially necklaces and earrings. Following the Louisiana Purchase in 1803 the Lewis and Clark expedition with the Corps of Discovery made their famous journey. In August of 1804, the expedition passed the Omaha village of Tonwantonga but found it empty. Many of the people had died during warfare and during the smallpox of 1802. The only encounter by the expedition with the Omaha was in September of 1804 when William Clark saw 48 Omaha prisoners who had been captured in a battle with the Sioux. Omaha History: What happened to the Omaha tribe? The following Omaha history timeline details facts, dates and famous landmarks of the people. The Omaha timeline explains what happened to the people of their tribe. Present day members of the tribe reside on the Omaha Reservation at Macy, Nebraska.